Select from Merlyn Showers modern range of shower doors and enclosures and take advantage of these rock bottom price deals. 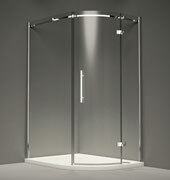 Buy Merlyn shower enclosures and shower trays at Fountain Direct. Here at Fountain Direct we have a wide range of elegant shower enclosures, shower doors and trays to help you build you perfect showering experience.